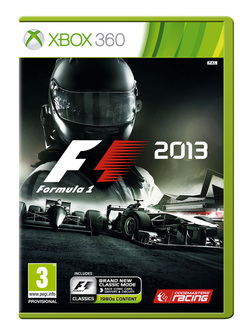 Your Guide to the Latest Installment in the Formula One Game Series. This page will give you detailed analysis of the new game from Codemasters. Standard or classic edition? Answer Below!! Firstly, the standard edition. It is a very good value game retailing at 39.99, giving you at least 30 hours of gameplay perhaps even more if you choose to do what me and Dan have done (full race weekend, 100% races) They take a while. The races are two hours a piece and that's for 19 races, THAT'S A LOT OF CONTENT FOR YOU MONEY. Then there is the classic content that you get even with the standard game. This gives you even more content that you can spend endless hours mucking around with, making the value of the game greater and greater. Now the actual 2013 content, this is again brilliant with the altered bit lane animations and the little tweaks here and there, make the game a much more well rounded one than any previous in the series. The handling of the cars seems to be more predictable but each car is noticeably different, meaning that you have to learn your car before you can become competitive. Each car seems to have a different sounds of the engines and be altered in the corners. This leads to you as a driver having to work harder to get each car to go faster, you cant just sling any setup on and the car will work, the realism has been taken to the next level. Tyre's, they are like the real things wear out too quickly and wont go as far as you think and have a serious cliff once you get on the edge of the performance. The engines are all different too.